The monogram in this ring is simply stunning, like an intricate gold design featuring arching letters set in a regal display for all to see. The 14K Yellow Gold Monogram Ring is a personal piece of jewelry that will stay with you a lifetime because of its lovely quality and design. This gorgeous ring features a 14k yellow gold band (3mm - 5mm) with a very clever design technique. The monogram is constructed to actually form the face of the band (13mm x 9mm). The monogram lettering is raised slightly from the gold band, bringing more prominence to the design and allowing light to pass through. The shadows add a wonderful accent to the ring, creating bolder lettering. The yellow gold features a high polish to bring out the warm tones in the precious metal, and the edges of the band are rounded to ensure the best fit possible. This gold ring is truly special. 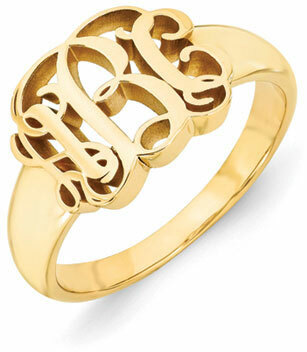 It provides a beautiful monogram in 14k gold, making it a quality family ring to be cherished for a lifetime. The stylish lettering will be admired again and again for the lovely detail and personal meaning. Monogram measures 13mm (1/2") x 9mm (3/8") and band measures 3mm (1/8") at the narrowest part to 5mm (3/16") closest to the monogram. We guarantee our 14K Yellow Gold Monogram Ring to be high quality, authentic jewelry, as described above.